It’s up to him and his new friends to win this war, or die trying. With the advent of new technologies the world powers are unable to conduct wars in the traditional sense. Instant and mutually assured destruction is the norm so wars are now fought virtually in the form of Virtual Reality Role Play Games. The idea is each side has a set number with minimal weapons and the last player standing wins. Nice, neat, clean, and non-lethal….or is it? Enter game designer, company VP, and a slightly out of shape Marine, Ryan Ellis, chillin in the civilian world… until he gets the, “We need you!” recall notice from the Corps. Once a Marine always a Marine and it’s off to the VR war for Ellis. Everything is going fine until the game developer in him noticed something was off. If you are a fan of old school video games this time Justin Sloan has dusted off the old school gamers guide and pays homage to some of the greats in this story. Zelda, Castlevania, DOOM, Secret of Mana, just to name a few. I was never a dedicated gamer but even I recognized some of these references. Told in Sloan’s usual style of action, action, humor, action, snarky dialog, action, totally LMAO inappropriate humor, action….well you get the point. 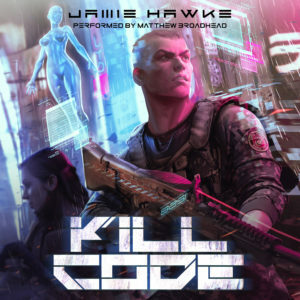 Kill Code is a well written and thought out fun read that will resonate with anyone who has played online games, we all know that there are hacks, cracks, patches, etc… for most every game so what would happen if some nefarious power figured out how to make virtual death a little more real?